Nothing is more enjoyable than Hot Garlic prawns. The Hellmann’s Real Ketchup sauce in this recipe accents the flavor of the prawns to make a stunning dish. Follow the recipe now! 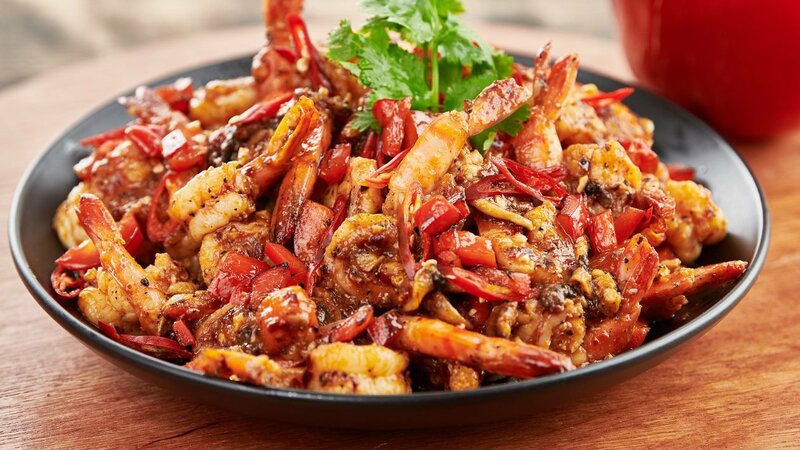 Heat oil in wok or large skillet until medium hot; cook and stir garlic and ginger in the hot oil until fragrant, about 30 seconds; add the prawns, mushrooms, black pepper, quick chili past, bell pepper, and cook, stirring, until prawns turns pink, 2 to 3 minutes. Combine the rice vinegar, fish sauce, Knorr Chicken Seasoning Powder and Hellmann’s Real Ketchup Sauce in a small bowl; Pour into the prawn mixture; cook and stir briefly to combine. Combine the cornstarch and stir into the wok. Stir until sauce has thickened, about a minute.